I posted last holiday season about Banana Republic using a promoted brand magazine on Flipboard to drive holiday sales. Since then, other businesses have followed suit in hopes to reach consumers in a new mobile environment. Many readers might ask “what exactly are promoted brand magazines on Flipboard?” To dive into this, let’s first look at what Flipboard is. Flipboard likes to refer to themselves as a custom magazine. From a user experience that is true. At its very core though, Flipboard is an RSS feed. However, unlike the RSS feeds of yesteryear -with their text-heavy updates and unorganized appearance- Flipboard displays content beautifully. 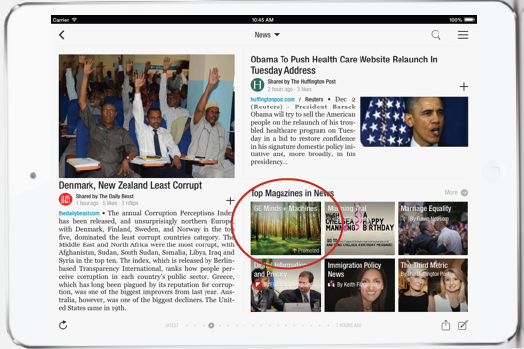 For starters, Flipboard organizes its RSS feed by content. Each type of content gets its own section (Flipboard likes to refer to them as tiles) on the Flipboard interface. For example, a user’s Flipboard might have tiles on Business News, Science, or Style. Once a user clicks on the tile, they’re taken to articles related to this content type. The Business News tile might have articles from the Wall Street Journal for the day’s trading numbers. The Science tile might have an article from NBC News about a discovery on Mercury. The Style tile might have an article from Seventeen magazine about the latest spring fashions. In addition to organizing content, Flipboard puts its main focus on photographs. For articles that have them, Flipboard pulls in an image from the text and displays it with the article’s title and summary. The result is a very pleasing way to view content.It follows the trends we’re seeing online, where images are the main focus over text. Think of sites like Pinterest and Mashable, where images are key to telling a story. A large selling point of Flipboard is users can choose the content they want. If a user follows someone on a social network, they can pull this user into their own section on Flipboard. Users can also create their own custom magazine. To do so, users select content on Flipboard or elsewhere, and using a downloadable application, they can simply press a button displaying a “+” sign and add this to their custom magazine. They can choose whatever content they’d like to add to this magazine. Think of it like a Pinterest board for content. So, where do promoted Brand Magazines come into play? Promoted Brand Magazines stem from custom magazines. Like any other user, businesses can create their own custom magazines with their own content, others’ content, or even a mix of the two. Once this magazine has been created, the business works with Flipboard to have the magazine promoted on the Flipboard app. Brand Magazines are promoted on Flipboard in two places. First, they are promoted on the main Flipboard page as the first tile on the screen. This placement is sold on a CPC basis weekly. It runs in the appropriate interest channel, such as News or Tech. The word “Promoted” is displayed within in the tile. Once a user taps on the tile, they’re taken to the Brand Magazine. Promoted Brand Magazine in Flipboard tile. The second placement of the magazine is via search. Flipboard users can search for content in the search toolbar at the top of the Flipboard app. The promoted Brand Magazine will display in search results based on keywords selected by the brand promoting a brand magazine. When a user taps on the search result, they’re taken to the Brand Magazine. What can promoted Brand Magazines on Flipboard do for businesses? Promoted Brand Magazines can gives businesses exposure to consumers in a place they haven’t been before. Flipboard is a truly unique environment. There isn’t as much ad blindness on such a new platform, meaning your business has a more a chance a user will notice and engage with your Brand Magainze. Additionally, Flipboard has done a great job tying in their promoted offerings within relevant content a user is already flipping through. If there is one thing Flipboard could improve upon, it would be to make Brand Magazines in search easier to find, and suggest additional keywords for businesses to use. I have found it quite hard to find some Brand Magazines because they aren’t purchasing against as many keywords as they should be.